The regular season is over and NBA playoffs are finally here! It is time to acknowledge and honor those who had marvelous performances during the 82-game grind of the regular season. Without further ado, let me hand out the individual awards for the MVP. ROY, MIP, DPOY, Sixth Man and COY. Statistics used are up to April 16, 2015. If you would like to check the previous editions of the Awards Watch, here is the First Edition and Second Edition at your disposal. Choosing between Stephen Curry and James Harden depends on your perspective and how you define "most valuable". There is no wrong pick between the two and both are very deserving but there can only be one MVP.My pick goes to Curry who is the best player on the best team in the NBA. His Warriors went 67-15 (better than LBJ in Miami) in a very tough Western Conference. He was very consistent and durable for the whole season. Curry finished 6th in scoring, 6th in assists and 1st in threes made. Steph Curry ran the perfect offense for a well-oiled GSW shooting machine. As for Harden, he had career-highs in scoring, assists, steals, blocks and rebounds. He was a much better team player (4 triple-doubles) and his defensive effort improved drastically. Harden carried the Rockets by himself during Dwight Howard's injury. 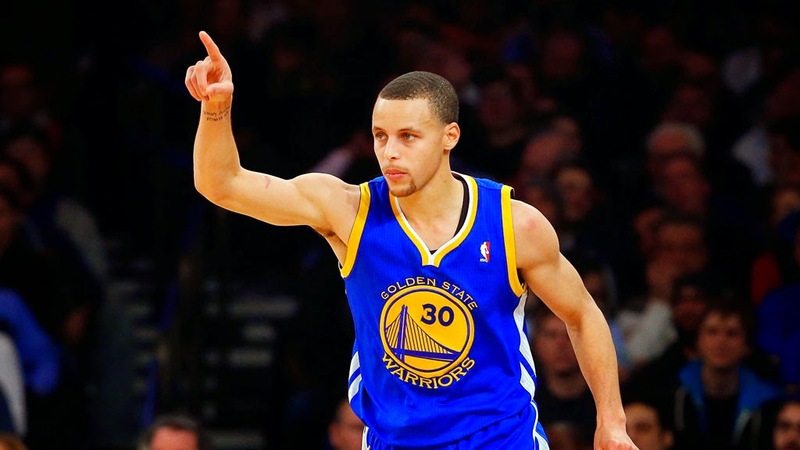 However, I will stick with Curry because this guy could take over games with his shooting, passing and ball-handling. His array of trick shots/layups definitely makes him one of the most entertaining and exciting players to watch. As for LBJ, Davis and Paul, they had great seasons but not quite good enough to rattle the top 2 candidates. While LBJ can virtually win MVP every year, the expectation that the Cavs would be a top team hurt his chances. Meanwhile, Davis will be a bonafide MVP candidate (and winner) in a year or two. 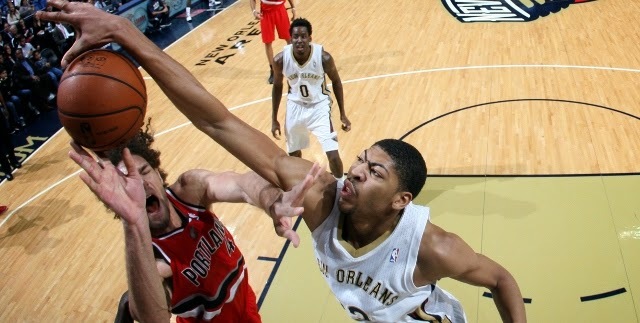 Well, we all know that Anthony Davis is a beast in only his third year. He managed to drag the Pelicans to the playoffs with his 24 points, 10 rebounds and 3 blocks per game. His jumper has vastly improved and his fade away and/or turnaround jumper in the low post will be unstoppable pretty soon. The best part about him is his ability to defend the perimeter and the low post. Davis finished top in blocks and if there was an official stat for altering shots, Davis would be up there too. I will admit that DeAndre Jordan of the Clippers can also win this award due to his rebounding (1st in NBA) and blocking (2nd) numbers. DJ definitely upped his defensive effort, intensity and pressure. BTW, he will become a free agent next season. Next up, Marc Gasol and the Grizzlies are 2nd in least points allowed and in the top 10 in opponent field goal percentage. Gasol is in the best shape of his career and that has translated into career-high in points while still averaging 8 boards and 1.6 blocks. The last two slots belong to forwards, Kawhi Leonard and Draymond Green. Both guys can guard perimeter players and occasionally smaller forwards too. Leonard has the edge on Green because "The Claw" has the distinction of being able to efficiently guard the likes of LeBron and Durant. Kawhi also led the league in steals per game. Wiggins over the Stifle Tower! Nasty! Andrew Wiggins will be the ROY and it ain't even a contest. His numbers were okay for a rookie (17 ppg, 4.6 rpg on 44% shooting) and he was the most consistent rookie among his draft class. He also became the #1 scoring option in Minny even if he wasn't ready to lead yet. In any case, if you love highlights like I do, Wiggins was a joy to watch. His athleticism is way up there and with more work in the summer, his handles and jumper should vastly improve. Next up, Elfrid Payton garnered 2 triple-doubles to go along with his 12 double-doubles. Payton seems to be the best defender on the Magic already. Then we have Fil-Am Jordan Clarkson who was the steal in this draft. He was named West Rookie of the Month for March and he officially became a starter on the Lakers. I'm curious to see how he will mesh with Kobe Bryant next season. Finally, Noel and Mirotic were decent contributors on their respective teams. 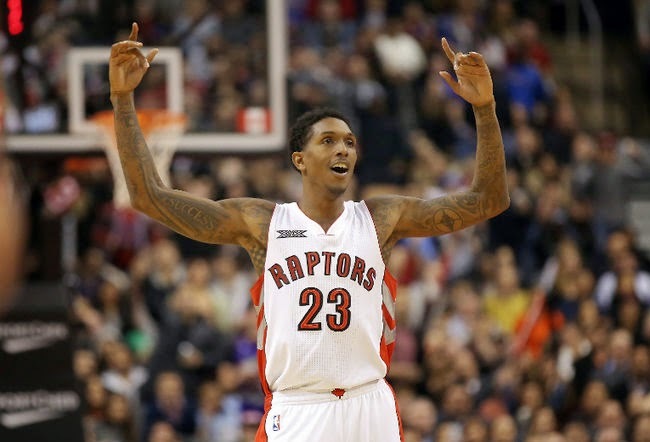 Lou Williams of the Raptors only plays 26 minutes per game and he comes off the bench but he averages almost 16 per game and he takes clutch shots for the Raps all the time. It is even arguable to say that he is the most important player on their roster. His best game of the season was a 36-point explosion vs the Cavs. Next up, Isaiah Thomas of the Celtics, led his team in scoring (19 ppg) during his 21 games with the Celtics after getting traded from the Suns. The Celtics made a surprising run to the playoffs because of Thomas. As for Jamal Crawford, he will always be in this conversation as long as he can shoot threes and exhibit his handles. Speights of the Dubs and Anderson of the Pelicans are efficient big men who helped their teams reach the playoffs. 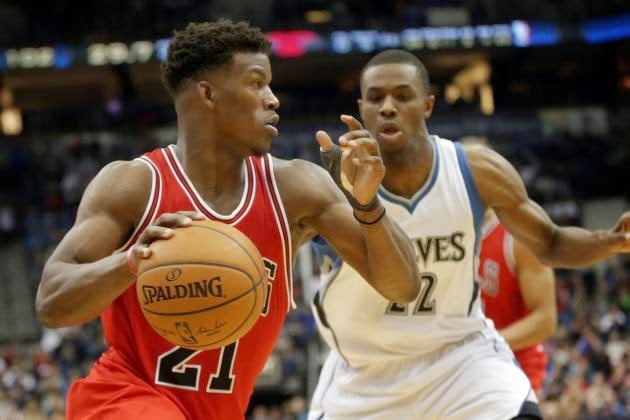 Jimmy Butler was an All-Star this season and he led the Bulls in scoring. He also plays excellent defense despite playing major minutes (#1 in minutes played). Butler increased his scoring by 7 points while getting career-highs in rebounds and assists. Meanwhile, Klay Thompson was on the same boat as Butler because he also became an All-Star this season. However, the jump in scoring average was not as good as Butler's and Klay's other stats were not as impressive. Moving on, Whiteside of the Heat came up with awesome numbers after getting called up from the D-League. Since Whiteside bounced around from different teams, can he sustain or improve his numbers next season after teams have thoroughly scouted him? 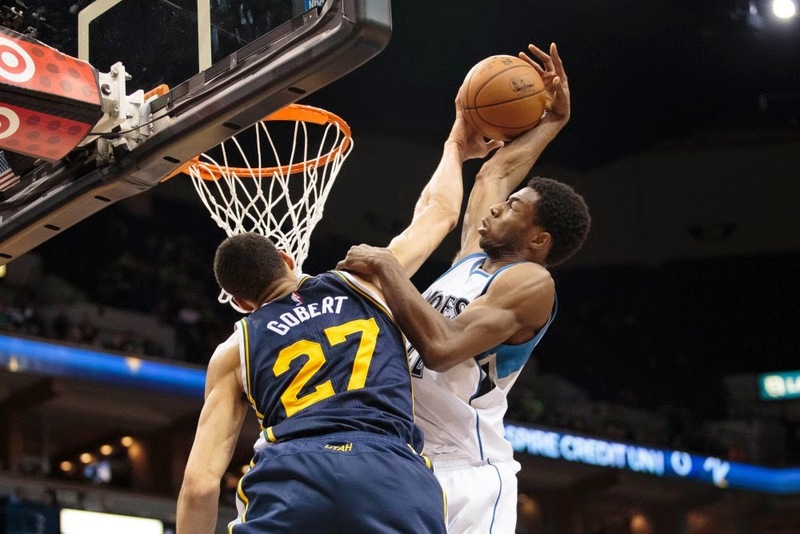 Finally, Giannis and Gobert have taken big steps this season to become starters and undoubtedly big pieces (literally) for the future of their team. 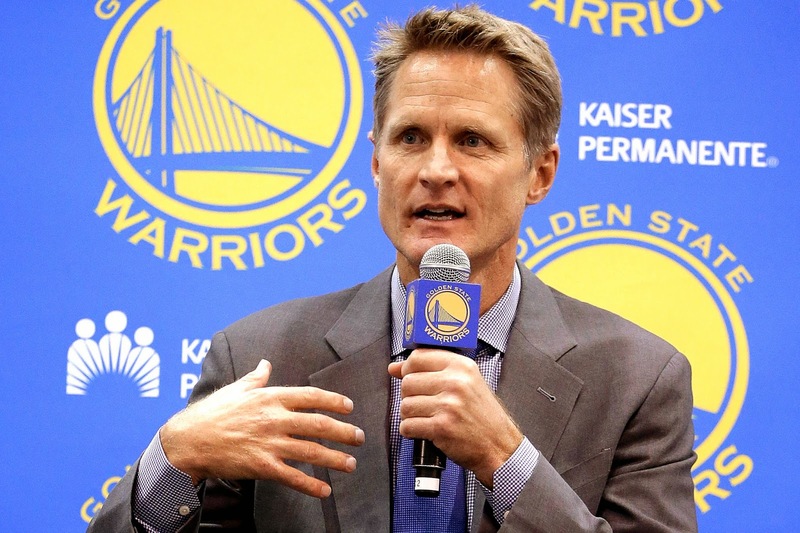 Kerr led the Warriors to the best record in the NBA in his first season as head coach. He did not have any prior coaching experience. He also managed to elevate the games of Curry and Thompson will making Bogut, Green and Speights better defenders. As for Budenholzer of the Hawks (Spurs East), he also has a good shot of winning COY. However, it hurts him that the Hawks are in the East while the Dubs mastered a much tougher Western Conference. Meanwhile, Pop will always be in this conversation as long as the Spurs remain competitive. To round up the list, Kidd and Stevens brought lottery teams into the playoffs and they should be commended for that even when they get bounced (or swept) in the first round of the playoffs.